I help people like you discover their potential, develop their skills to paint and create works of art that they'll be proud of! ready to learn how TO IMPROVE YOUR SKILLS TO PAINT BETTER?? 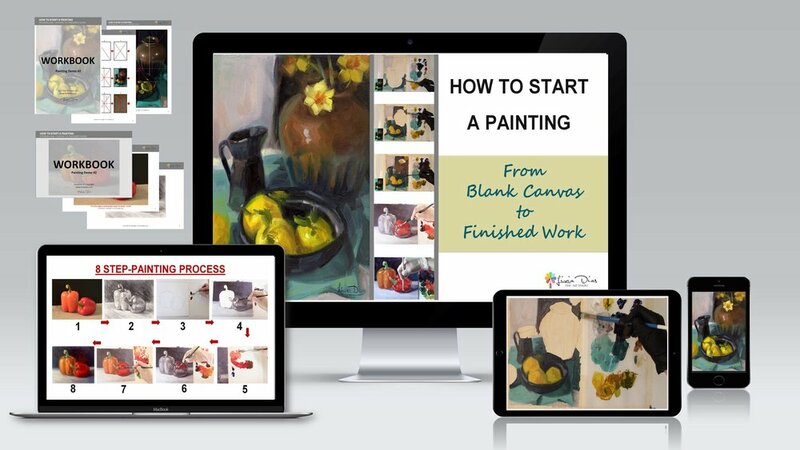 How to Start a Painting - From Blank Canvas to Finished Work will help you understand the painting process as you learn how to build your painting in eight different stages. You will also discover how to work with the 'wet-into-wet' Alla Prima method to create a painterly approach to your painting. How to understand and represent tonal values well so that you can improve the illusion of form and depth in your Landscape. This is a step-by-step course where you learn the principles and techniques you need to create form and depth in your landscape painting. Already an enrolled student? Click here to go to the course website and log in to your course! Ready to Discover How to Add Luminosity, Colour Poetry and Loose Brushwork to your Painting by Using Sorolla's Techniques? 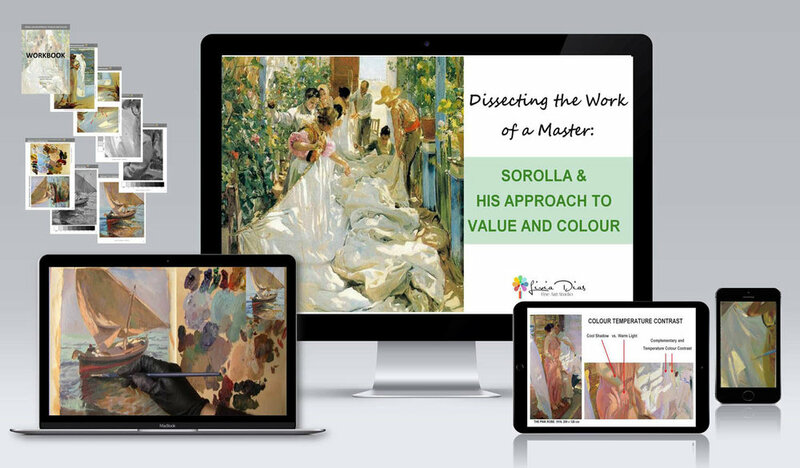 'Sorolla & his Approach to Value and Colour' will help you understand and apply Sorolla's outstanding techniques so that you can create paintings filled with luminosity, vitality and vibrancy. 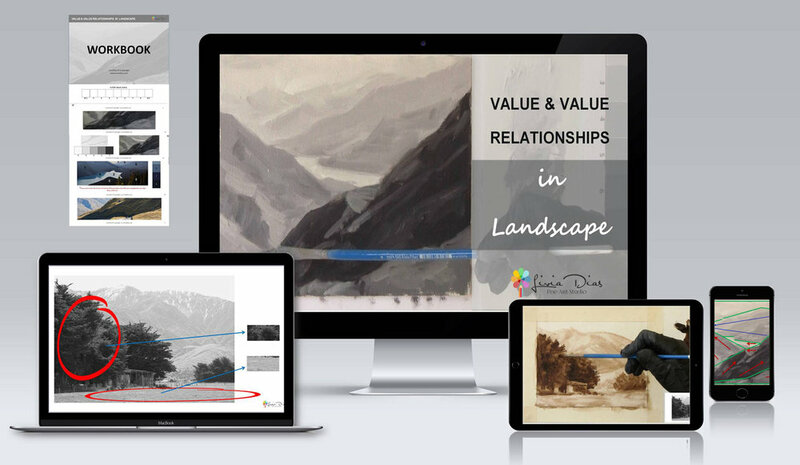 In this course, I analyse how one of the history’s most brilliant artists, Joaquin Sorolla, approached Value and Colour. You'll learn how he related value to colour and how he used advanced colour techniques to interpret and represent the effects of light with so much beauty and poetry. This course includes lectures explaining his techniques as well as painting demonstrations showing you how to apply them. Mix and use colors like a PRO and create beautiful light and color-filled paintings again and again. The step-by-step program where you discover how to implement color theory and essential color techniques to create the light and color-filled oil paintings 'you're dreaming of'. In this course, I take you by the hand and show you exactly how to build your knowledge to understand color and how to implement essential principles and techniques to mix and use your colors so that you can create beautiful oil paintings you’ll be proud of. Mastering Oil Color Mixing Course will be launching sometime in 2019. Sign up for the FREE ROADMAP to Color Theory Fundamentals below and you'll be added to the special VIP list that gets early access and bonus content! Grab your Free Roadmap to color theory! Learn How to Paint Roses in Oil with a Fresh and Loose Approach. The step-by-step course where you discover how to implement the essential principles and techniques to paint roses in oil with more freedom and expression. Enter your details below to get notified when this course will launch! want to improve your color mixing skills? My brand new course is coming soon! Click the button below to be the first to find out and to download my FREE Mastering Oil Color Mixing™ Roadmap to Color Theory now!